The Novello theatre is located on Aldwych and was built as one of a pair with sister theatre The Aldwych. Over the years the Novello Theatre has played host to The Royal Shakespeare Company’s annual London season as well as Broadway hit musical Footloose. 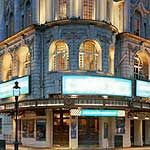 Do you work at Novello Theatre? What did you think of Novello Theatre?